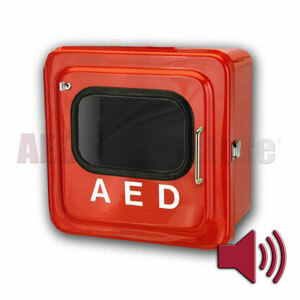 Outdoor AED Cabinet with Audible Alarm. This sturdy fiberglass surface-mount cabinet is ideal for outdoor applications. Water resistant and dust resistant! Will not rust! Door-activated audible alarm alerts everyone in the area the AED has been deployed for rescue. Inside tank dimensions: 14"H x 14"W x 8"D. Shipping weight 13 lbs. Please note: Per manufacturer's instructions, if you drill holes in the cabinet you must fill and seal them with silicone to maintain watertight seal. Mounting hardware not included.